In today’s military applications, the diversity of environmental factors that can render a computer-grade on-line uninterruptible power supply (UPS) inoperable is only exceeded by the number and magnitude of power quality related problems that are often encountered. Most on-line UPS products have been designed for installation in a fixed and protected environment with a controlled temperature range of 32°F to 104°F (0°C to 40°C). They can provide reliable operation when installed in a laboratory, office or computer room environment and their price is low. However, many military applications require that the UPS be installed in battlefield environments far more demanding than a computer room. They are subjected to higher levels of shock and vibration, airborne contamination and wider operational temperature extremes. In addition, the UPS needs to provide clean computer-grade output power while operating from extremely polluted power sources. Military-grade commercial-off-the-shelf (MILCOTS) on-line UPS products provide a viable solution in meeting the demanding requirement of heavy industrial applications. For aircraft applications, the military’s move to implementing low cost single-phase COTS equipment into aircraft and other 400Hz three-phase mobile applications is exacerbating voltage and current imbalance. The primary concern of voltage imbalance is harmonics and the resulting heating effect as well as the reduction in service life of three-phase motors on the same power bus. A small voltage imbalance of 1% results in a 5-6% current imbalance and may be problematic. 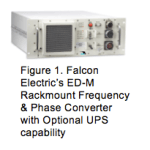 An active three-phase/frequency converter (figure 1) can be a good solution. The device connects to three-phase, 400Hz aircraft power. Through the use of double-conversion and Pulse Width Modulated Inverter (PWM) technologies, the converter changes the incoming power to a DC voltage, regulates the DC and recreates new single-phase, 50, 60 or 400Hz output power with a ±3% voltage regulation. The frequency converter can typically operate over a wide input voltage range while maintaining a balanced load on the three-phase 400Hz bus. The converter provides clean, regulated single-phase sine wave power to the critical load. An optional external battery module is available providing several minutes of ride-through in the event of a momentary or sustained loss of aircraft bus power.